Find the perfect hotel for your stay in London - from discount and affordable London hotels for the budget traveler to luxury four star and five star London accomodations. You can also search for hotels in London that cater to your specific needs, such as extended stay hotels, hotels for business traveler / event planning, suite / boutique hotels and much more. Combining Victorian splendor with kingly hospitality in the elegant borough of Kensington and Chelsea, the unique character of this traditional London townhouse-style hotel is instantly beguiling: a refined combination of luxury, charm and style. Savor the tasteful atmosphere created by the English architecture and London lifestyle -relax in the award winning garden, a truly unique oasis of peace and tranquility in the center of the city. The privileged location, quiet but central, is a special bonus. Just a short walk from the subway station, the hotel is also right next door to the famous Earl's Court exhibition center. London's many museums and tourist attractions are within easy reach - as are the many exclusive shops and stores in Knightsbridge, home of Harrods, and Westfield Shopping centre. Tucked away in the heart of historic St James's, and just minutes from London's iconic landmarks and vibrant West End, The Stafford London is one of the finest luxury hotels in the Capital. Luxuriate in the stunning individually designed rooms and suites, dine in elegant surroundings in The Lyttelton restaurant or relax with a cocktail in the renowned American Bar. Our stylish rooms and suites are guaranteed to help you relax. The Main House, is a blend of Victorian grandeur and modern comfort, while the Carriage House offers a unique, countryside ambiance in the heart of London. The Mews Suites and Penthouse offer classic, contemporary elegance and the comfort and discretion of your own private residence at one of London's most prestigious addresses. Rosewood London is an ultra-luxury hotel on High Holborn that combines English heritage with contemporary sophistication in a central location. Set in the heart of the city near Covent Garden, the City and West End theatres, it is an ideal base for business and sightseeing in London. Rosewood London offers guests true urban sanctuaries, with 262 rooms and 44 suites that are among the top hotels in London. Informed by the grand traditions of a British manor home, the five-star hotel's stylish interiors - all dreamed up by designer Tony Chi and Associates - are crafted from the finest materials and appointed to the highest standard. Perfectly positioned just moments from Trafalgar Square, Westminster and Covent Garden, yet close to Mayfair and The City's Square Mile, our new flagship provides state-of-the-art facilities in an eminent building dating back to 1885 and the Empire days of Queen Victoria. Astonishing cultural diversity, illustrious regal history, iconic architecture and the coolest modern art. London is quite simply the undisputed capital of the world. In April 2011, the heart of this ancient Roman city gained a distinguished new landmark - a graceful and historic luxury hotel that sets new standards in opulence and comfort. 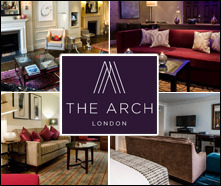 A warm welcome to The Arch London, a luxurious boutique hotel located in Great Cumberland Place. Our urban sanctuary blends Georgian grandeur and English heritage with exceptional modern facilities. As an independent hotel we're able to do things a little differently and we think you'll enjoy our flawless personal service combined with laid-back luxury surroundings. If you're seeking a five star hotel that delivers more, we look forward to welcoming you very soon. 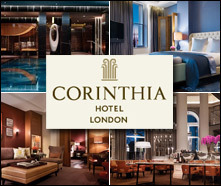 Our Central London Hotel is perfect for both business and pleasure. Whether you plan to enjoy the splendour of a walk in Hyde Park, take in a show in the West End or hit the high streets of Regent Street, Bond Street and Oxford street, The Arch Hotel London is the perfect base from which to start. Once the home of Lords and Ladies of the Royal Court, Taj 51 Buckingham Gate now provides its guests with some of the most spacious and luxurious accommodation and finest personal service in London, featuring Taj's acclaimed Golden Keys Concierge Service.Three palatial townhouses overlook a private courtyard, with each offering suites of individual character. Choose from 1, 2 or 3 bedroom suites, larger residences with up to 6 bedrooms or one of our 4 sumptuous signature suites. Each and every suite or residence combines spacious living areas and a fully equipped kitchen, designed to provide unforgettable home-away-from-home experiences, right in the heart of London. Welcome to The Marble Arch by Montcalm London, a contemporary five star boutique accommodation, designed to appease those looking for the proverbial 'good things that come in small packages'. And although housed in a petite townhouse in the heart of central London, The Marble Arch by Montcalm London is where you'd come to live king size. Ideally located within strolling distance of Oxford Street and within easy reach of London's landmarks, this chic property offers a calming and peaceful retreat for an experience to remember. The Marble Arch by Montcalm London boasts inviting rooms, beautifully designed and complete with modern amenities including complimentary broadband and Wi-Fi, LCD TV with satellite channels, tea/coffee making facilities, in-room safe and much more. Where heritage meets contemporary elegance. Dorsett Shepherds Bush, the perfect hotel choice for both business and leisure travellers offers stylish and comfortable accommodation for the most discerning guests to enjoy, relax, party and refresh. The 8-storey hotel with 317 rooms boasts modern architecture and design - originally The Pavilion is a Grade II listed building, which overlooks Shepherds Bush Green, retaining the building's historic facade. The hotel offers 2 restaurants, destination bar and a spa. In Stratford London, The Westbridge Hotel offers rooms and restaurant with easy access. The hotel has its own fitness center, and provides free Wi-Fi throughout. Guests can expect elegantly decorated rooms at The Westbridge, some with chandeliers and roll-top baths in the suites. Each bedroom comes with a flat-screen TV, tea/coffee-making essentials and complimentary toiletries. Suites and rooms with balconies and city views are also available. Breakfast, Lunch, Dinner is served in The Westbridge Hotel Restaurant, while the hotel lounge with its leather sofas, high ceilings and original fireplaces is open 24 hours. Its Art Deco origins can be clearly seen in the exquisite and understated bas relief features on the exterior. However in the years since it opened, frequent renovation, new design touches and extensive modernisation have made this hotel a favourite for the many visitors who call this their business base and home away from home. Check into The Washington Mayfair Hotel and you will be staying in one of London's finest locations, Curzon Street, tucked into the heart of Mayfair a few minutes from Park Lane and offering a perfect alternative to the famous 5 star Park Lane Hotels. Located in the heart of the action and near the city's main theatres, exclusive boutiques, fashionable hot spots and trendy night clubs, ME London isone of the leading hotels in the centre of London. It is contemporary and cutting edge in style and located in one of the most important tourist destinations in the world. Designed by the world famous architects Foster and Partners, amongst its fantastic services and facilities ME London provides 157 exquisitely designed, modern rooms, including 16 suites, two New York restaurants (Cucina Asellina and STK London), Roof Bar with outdoor terrace and spectacular panoramic views of London (London Eye, Trafalgar Square, Tower Bridge, Covent Garden) and Marconi Lounge, 7 meeting rooms measuring 500 m2 with capacity for up to 300 people and a separate reception area, a modern, fully equipped gym, open 24 hours a day and high speed WiFi internet. 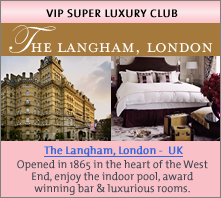 Originally opened in 1865, The Langham, London was Europe's first 'Grand Hotel' and now after a remarkable �80 million transformation, the hotel unveils a stunning new look. With an unrivalled location in the heart of the West End at the top of Regent Street, London's shopping delights and famous theatres is on its doorstep. Take a plunge into the 16 metre indoor swimming pool, be pampered to a massage in Chuan Spa, enjoy cocktails in the award winning Artesian bar or indulge in a fine dining experience in Roux at The Landau. Perfectly situated on prestigious Jermyn Street, in the heart of Mayfair parallel to Piccadilly in Central London, The Cavendish London, a 4 Star Deluxe hotel is a welcome calm in the heart of London. Not only is the hotel an ideal base for those seeking the thrill of London's theatreland, world class shopping and restaurants, it is an oasis of calm where guests can escape, relax and unwind when in London. Whether staying for business or pleasure the hotel's 230 contemporary bedrooms provide guests with a warm, tranquil environment to escape to. There is so much entertainment on your doorstep - both popular as well as more unusual things to do in London. Located in Knightsbridge on the edge of Hyde Park, Bulgari Hotel London is both a haven of calm in the centre of the city and yet under a minute's walk from such landmarks as the famous Harrods department store. 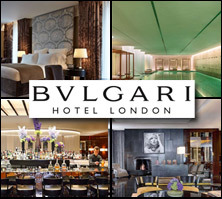 Since opening in 2012, Bulgari has set new standards among the luxury hotels of the British capital. Elegant contemporary architecture and Bulgari's legendary flair for design are matched by class-leading quality of service. Design, service, and exceptionally generously proportioned rooms and suites combined with unrivalled facilities such as a full gymnasium and physical training centre with on-site Workshop personal training team - 11 single treatment rooms and 1 private spa suite Spa - 25 metres, three-lane swimming pool - 47 seat cinema - unique Cigar Shop and sampling room, a stunning Ballroom - to deliver a city hotel experience that is unique in the world.